Recognition of professionalism and financial incentives are some of the benefits of the provincial Certified Tidal Angling Guide program (commonly referred to as CTAG). And thanks to people like Bill Sargent, Bob Cole, Mike Kelly and Pat Ahern, it has become even easier for those on Vancouver Island to become certified. That’s because Sargent and his colleagues, all certified guides, have taken the extra step to become the newest group of CTAG assessors. 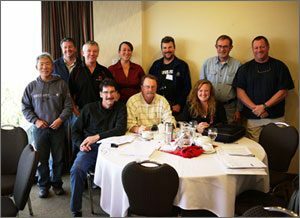 CTAG was developed by the sport fishing community, go2HR, the Industry Training Authority and other stakeholders, and these groups agreed early on that the very best guides from British Columbia’s sport fishing industry should become the program’s assessors. Port Alberni-based Pat Ahern, who became CTAG certified three years ago, decided recently to become an assessor for the same reasons as Kelly. Plus, as president of the West Coast Fishing Guides Association, he predicts that CTAG will soon be widely viewed as a stamp of excellence and therefore a boon to business. “And because it’s designed by industry, it’s a program that any professional can buy into,” he says. Bob Cole, also Port Alberni-based, is unique in that he has been in the marine business for 30 years and organizes charters for charity. “Even though I haven’t had as much guiding experience as others who are full-time guides, because I have employed a lot of guides over the years, I was asked if I would become an assessor. I said yes simply because of the benefits CTAG has given me as a charter operator. Click here to find out more about the Tidal Angling Guide requirements and challenge process.